The seesaw of supply and demand is our best barometer of the health of the housing market – so naturally we closely watch it. We have been in a seller’s market for such an extensive period that like most veteran agents, we are expecting a correction. A rebalance of the market we hope will come in the form of a gradual increase in supply due to a lessening of demand; ultimately resulting in a balanced market. “October marks the 4th month in a row that supply has continued to rise between $200K – $400K, which is good news for many buyers as it provides them with more choice and fewer competing offers. However, for those buyers with budgets under $200K, this trend in supply doesn’t apply to them and their choices are still extremely limited..
We are examining the first week of October in more detail to study how new listing counts dropped unexpectedly. We counted 2,017 new listings in Greater Phoenix during the first full week which is down dramatically from the same week in 2017. The overall decline is 23% year over year and this is the lowest number of new listings we have ever seen for the first week of October. The previous record low was 2,343 in 2014…. For whatever reason, sellers are surprisingly rare this month. 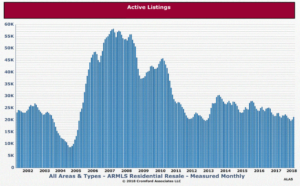 Even if we change the measurement week to Oct 3 to Oct 9, the picture does not change – new listings down 25% from 2,520 in 2017 to 1,885 in 2018. This latter total is once again the lowest we have ever recorded for those dates. Mortgage rates tend to increase when the economy is strong…. People usually worry about higher rates discouraging buyers and while that is a reasonable concern, I am also of the opinion that higher rates discourage sellers, because in most cases they are going to move somewhere else and pay a higher rate too. If they have the option to stay put, they may choose to do so when rates are increasing. … Freddie Mac reported an average of 4.63% during September for the 30 year fixed. This is the highest we have seen since May 2011, more than 7 years ago. Of course in 2011 this seemed like a very low rate because we had experienced rates over 6% almost continuously between 1970 and 2008, with occasional short periods in the mid 5s. Now we have a lot of homeowners with loans bearing rates of 3.5% to 4.25% taken out over the past 7 years. To move to a new home, they will need to pay off that cheap loan and take out another at closer to 5%. This effect is likely to be a drag on the supply of re-sale homes for a long time to come. It is likely to be good news for remodeling companies as many home owners decide to preserve their cheap financing by staying in place and spending their upgrade money on improving and modernizing their existing home instead. Of course we cannot ignore the demand side of the equation. A gentle lessening in demand appears to be underway – which ultimately effects supply. When fewer buyers buy, supply typically begins to rise. Which piece of the equation will affect 2019? Will the lessened demand help shift the market towards balance or will sellers be reluctant to sell causing supply to remain scarce? Either way, we will continue to monitor it and comment on it. In the meantime, we want to give our heartfelt thanks for our wonderful friends and clients who place so much trust in us. We are grateful every day. We wish you all a wonderful holiday season.